The simple answer is, Yes! Using a Waterpik as part of your daily dental routine can indeed prevent and reverse gum disease. Read on to find out how, and why! So how do you get started? There are various Waterpik models available. These range in size from countertop versions to those designed for travel. Also, price points stretch from $50 to upwards of $100. Bottom line? You can find a Waterpik model that is right for you! It’s one of those things we don’t like to think about. Meanwhile, it can busy taking hold just below the surface of our gums. It can be caused by gingivitis or periodontitis, both of which can be easily prevented with proper oral hygiene. But how serious are these two conditions? And how badly can they impact your oral health? Let’s start with gingivitis: a slight irritation of the gums which may seem harmless but can cause much more serious oral health issues. Gingivitis is a mild form of gum disease. But it can lead to more serious issues like periodontal disease if left untreated. It’s caused by the build-up of bacterial plaque around the tooth. This triggers an immune response which not only causes inflammation of the gums. It can also cause the gums to begin to separate from teeth. This is when the trouble begins as bacteria can creep in. The good news is that the signs of gingivitis can be reversed. 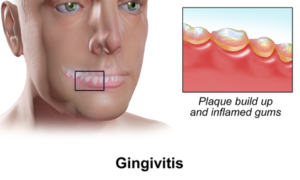 But what exactly are symptoms of gingivitis? The signs and symptoms of gingivitis can easily go unnoticed due to their mildness. The classic signs are red, swollen and tender gums which tend to bleed when brushing. Also, it can cause pockets to form between teeth and gums where food particles can get trapped. A side effect of this is bad breath and/or a bad taste in the mouth. If you notice any of these symptoms, you’ll want to take steps to curb any further damage or deterioration of the gum line. Nipping this less serious nuisance in the bud will prevent the onset of more serious gum disease such as periodontitis. It makes sense to be vigilant when dealing with gingivitis because otherwise it can lead to the more severe periodontitis. Periodontal disease (or periodontitis) is caused by toxins released by the bacteria in plaque. These toxins cause a more severe separation of the gums from teeth. As this is an advanced form of gum disease, you risk the chance of the gums themselves becoming infected. Why is this so concerning? The answer is simple. 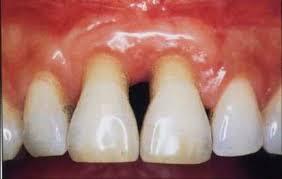 A side-effect of periodontitis is tooth loss. So preventing periodontitis is vital to preserving your winning smile. The problem is, though the disease is serious, it often has only mild signs or symptoms. And that’s why it’s best to get into the habit of practising good dental hygiene to prevent the onset of any form of gum disease, regardless of how mild, before it begins to form. How can you prevent the onset of gum disease? We all know we should be flossing daily. But many of us find it hard to use traditional floss . So, the fast, effective and simple alternative is water flossing. This is a great addition to your daily brushing routine and it quickly improves your oral health. Water flossing can also actually reverse the signs of gum disease. Water flossing is also over 50% more effective than traditional flossing. Plus it’s much easier for those of us with dexterity issues or tightly spaced teeth. Furthermore, water flossing is more effective at reducing the key components of gum disease: inflammation and plaque. One of the first signs of gingivitis is inflammation of the gums. By water flossing on a daily basis, you’ll be able to reduce inflammation of the gums and prevent gingivitis. Inflammation of the gums also causes bleeding. So if your gums bleed when brushing or visiting the dentist, begin water flossing right away. Studies show that water flossing reduces bleeding by 93% and is up to 52% more effective at reducing gingivitis than string floss. At the first sign of inflammation, incorporate water flossing into your dental routine and send gingivitis packing! Plaque is a sticky film that clings to teeth and provides a breeding ground for bacteria. This in turn causes gum disease. So it’s important to remove it every day. Water flossing is a great way to prevent or eliminate plaque. And the Waterpik brand offers different flossing tips, including the Plaque Seeker® tip, which helps wipe out plaque in hard to reach places. Two big advantages of incorporating water flossing into your daily dental routine are ease of use and saving time. Using a Waterpik takes only takes 60-seconds per day! So for only one additional minute a day you will be eliminating and/or preventing signs of plaque and inflammation. And you’ll be doing it exponentially with a minimum of time and effort. Put simply, water flossing is proven to be more effective than string flossing at quickly and effectively reducing inflammation and plaque. If you are not already considering incorporating water flossing into your dental hygiene routine, preventing or reversing gum disease is a great reason to do so. So run out and purchase a water flosser or order one online today! There is no simpler or more effective manner of preventing or reversing gum disease than by water flossing daily! Pingback: Waterpik Cordless Freedom: The Ultimate Travel Water Flosser? Pingback: Waterpik Aquarius Review: Is This The Best Water Flosser Around?